One of the most important Australian printmakers of the inter-war period, Jessie Traill produced a number of distinctive etchings which paired lyrical subjects from nature with dynamic industrial imagery. She infused many of her scenes with a sense of the progress of modernity, culminating in her celebrated Building the Harbour Bridge series of 1927-31. Born in Melbourne to a wealthy family with an interest in the arts, the young Jessie Traill befriended artist Tom Roberts, who encouraged her to become an artist. Through extensive travel in France, England and Australia, she developed a cosmopolitan outlook that would continuously inform her career. After the death of her parents, she commenced art studies at the National Gallery School from 1901 to 1906 and was taught by the Australian impressionists Frederick McCubbin and John Mather. Mather was one of the first artists to practice etching in Australia; his plein air prints of the countryside around Melbourne would later provide inspiration for Traill’s own work. In 1906 Traill left for Europe where she studied at the Academie Colarossi and La Grande Chaumière in Paris and was inspired by the art nouveau movement. This was particularly evident in her sensuous depiction of trees, such as in the decorative frieze of trunks and branches that define the composition in Ti-Tree Frieze 1910. From Paris, Traill travelled to London in 1907 where she studied with Frank Brangwyn, who exerted a powerful influence on her work. He encouraged her to use larger plates, more forceful lines and the dramatic effects of chiaroscuro as reflected in her early Charing Cross Bridge 1908. This etching also reveals Traill’s growing interest in industrial subjects of bridges and ships influenced by Brangwyn’s images of construction sites. Traill exhibited at the Royal Academy and the Old Salon in 1908 and upon her return to Australia in 1909 held her first solo exhibition in Melbourne. During World War One Traill was a member of the British Voluntary Aid Detachment active in France. 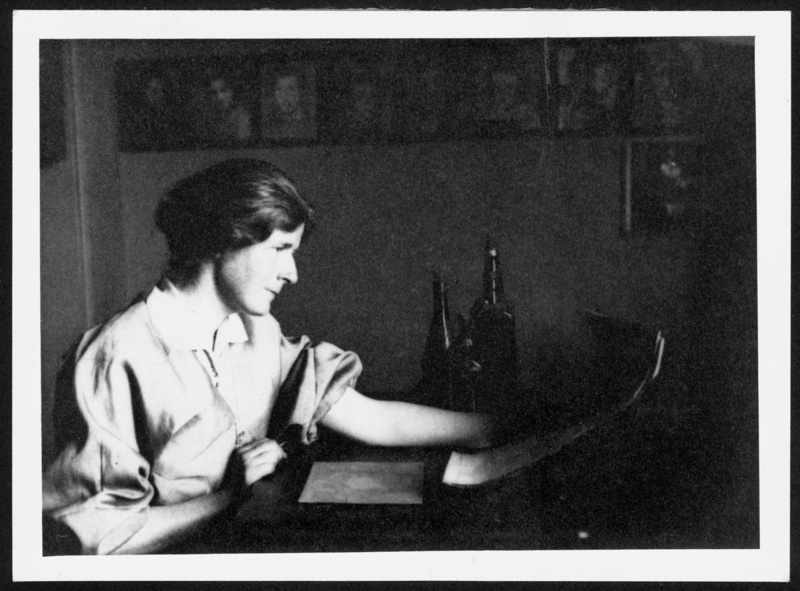 After the war she joined the newly-formed Australian Painter-Etchers Society and regularly took part in their exhibitions entering into a productive phase of work in the 1920s. Her prints produced during this period were dominated by two major subjects: the bush, particularly nocturnes, and industrial subjects such as factories and buildings under scaffolding. In 1922 Traill visited Red Cliffs, in northwest Victoria, where she made a number of etchings, including End of the day, Red Cliffs 1923, which were exhibited at Broken Hill. Returning to England via New Zealand and the United States in 1925, she submitted several etchings to the annual exhibition of the Society of Graphic Arts and was elected a member of the society. Back in Australia Traill visited Central Australia in 1928 and was the first white artist to paint the region and mount an exhibition at Alice Springs, where she pinned her watercolours to blankets at the police station. With a strong emphasis on line used to articulate the scale and depth of the construction, the early etchings in the series, exemplified in Building the Harbour Bridge I, beginnings 1927 and Building the Harbour Bridge IV: the ants’ progress, November 1929 1929, depict tiny ant-like figures dwarfed by pylons and scaffolding. In the later works, which focus on the physical tension inherent in the reach and span of the bridge’s arch, Traill uses a Whistlerian sense of design and tone to great effect to define mass, space and mood. As interest in the medium declined, Traill stopped producing etchings in the 1930s and spent her later years at her cottage near Berwick, Victoria, as well as in England and France. Her prints were the subject of a retrospective exhibition at the National Gallery of Australia in 2013.